Your future is 100 percent determined by the perspective you take on it. The more you manufacture a perspective that your future is adventurous, exciting, and full of positive opportunity, the more it turns out that way. This is not positive thinking mumbo jumbo. It’s how life can work. Bear with me as I argue the point. If you’re feeling crappy about world conditions, if you’re pessimistic about the future because of climate change, if you think the one percent is ruining the planet for the rest of us and keeping the 99 percent impoverished, dependent, and beholden to their whims, no wonder your future seems bleak. How could it not when you’re focusing on every potential negative thing out there? You manufacture everything you experience, including experiences you don’t enjoy. I’ve said from Copiosis’s beginning that the 99 percent is as responsible for the problems they perceive as the one percent they blame. That we manufacture everything we experience is partly why I say this. The other reason is the 99 percent perpetuate this “reality” by participating in what they claim oppresses them. How? There are many more ways, far too many to mention, in which we all (yes, me too) perpetuate conditions we’d rather see gone. Even this blog post perpetuates said conditions by focusing both my attention and the attention of those who read it on the status quo. You could almost say there is no way to not perpetuate more of what we’d prefer not to have. But then why write this post? Because there is a way to not perpetuate it. It is so simple, everyone can do it. No matter your current situation, you can shift your experience of it. From that shift you can create a wholly different present moment and change the future. Hold onto that shifted perspective long enough, and before you know it you’ll see evidence of the shift showing up for your five senses. You’ll start feeling better when you disconnect from the network news on the Internet, television, and radio. You’ll feel more relaxed not paying attention to what’s going on in the world. Seemingly at random, you’ll start meeting people, experiencing events (small at first, larger later) and receiving ideas that uplift your spirit. You’ll smile more. You’ll turn off the tv, get outside more, question more, conclude less. As all this is happening, suddenly, without knowing why, you discover not only that your new perspective has buoyed your spirit—you’re happier—but your future feels brighter too. You’ll get excited—as I am, as the people I’m working with are—about the future. Positive action you believe not only makes a difference in the world, it makes a difference in you. It empowers you, emboldens you. Your confidence returns, your positive belief returns, you feel capable of changing your life and the world. Anything’s possible, and that feeling you had as a child when all the world was ahead of you, returns. The future becomes exciting, all from a change in perspective. Our team at Copiosis is well into this perspective-changing business. I’ve written over and over about our accomplishments, since taking on making capitalism, governments, and corporate-controlled markets a thing of the past. As our accomplishments pile upon each other, their visibility and impact increases too. Our success is a foregone conclusion, so long as we continue doing what we’re doing. Are you looking out for a hero? The era of charismatic heroes is long gone. Mass movements no longer work. What can work—what does work—is ordinary people tapping into their innate, personal capability, and creating the world they want to see rather than waiting for someone to create it for them. We at Copiosis understand this and that is why we believe the future is exciting. You don’t have to join us in our work. Make your own future exciting in your own unique way. 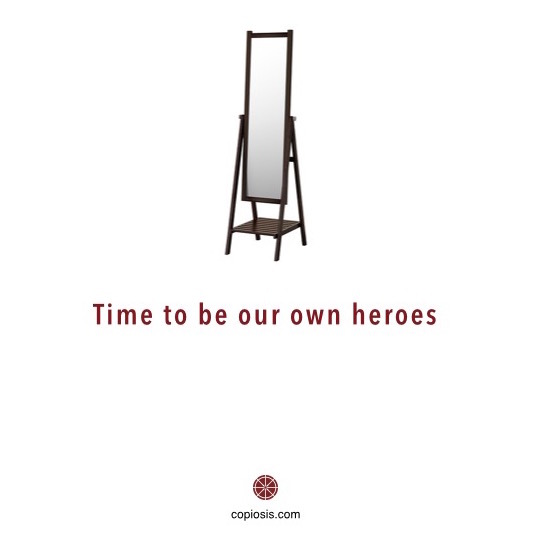 We are all our own heroes now. Let’s get busy!